Stars form from gas and dust floating in interstellar space. But, astronomers do not yet fully understand how it is possible to form the massive stars seen in space. One key issue is gas rotation. The parent cloud rotates slowly in the initial stage and the rotation becomes faster as the cloud shrinks due to self-gravity. Stars formed in such a process should have very rapid rotation, but this is not the case. The stars observed in the Universe rotate more slowly. ALMA also imaged rotation of a gas jet from a low-mass protostar. 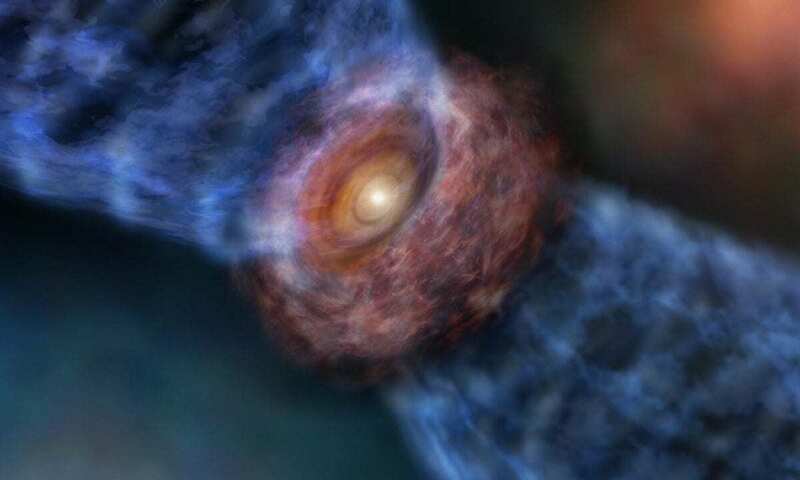 Please read the press release “Baby Star Spits a “Spinning Jet” As It Munches -Down on a “Space Hamburger”” from the Academia Sinica Institute of Astronomy and Astrophysics, Taiwan.